Convert DisplayPort connections to HDMI with support for resolutions up to 4K 30Hz UHD (3840 x 2160). 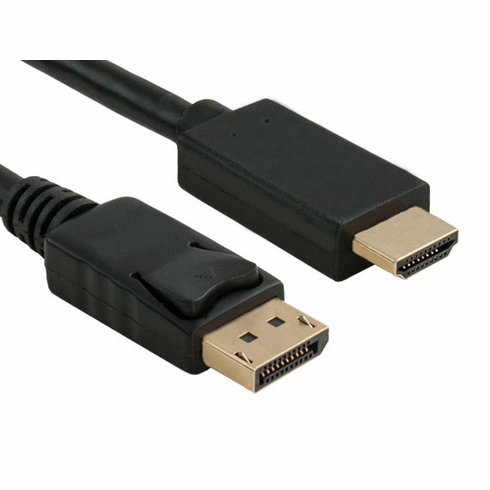 The DisplayPort to HDMI cable plugs into any computer or source with DisplayPort and outputs onto a HDMI display, letting you maximize viewing on Ultra HD televisions or monitors. Display 4K UHD content at up to 30Hz. This is ideal for Ultra HD content and devices, such as internet streams, gaming systems (PS4 Pro), and more. At 15 feet in length, the cable is designed to provide easy conversion from DisplayPort to HDMI, eliminating the need of purchasing an extension cable. Cable did what was needed, great price. PCH cables always has the best prices! I feel very fortunate to live so close to this business. We would have easily paid 3 time as much for the same cable elsewhere. Online purchase made the transaction very easy! ProsBrings Video and Audio from laptop to TV. Allows for viewing of webinars and PowerPoint presentations. Great cable length. Many new computers only have one (1) HDMI outlet. This allows a 2nd monitor with HDMI outlet to be plugged into your computer using the "Display Port". ProsSolves a 2nd monitor issue.